Daily Spirit & Word: 779: Freedom From Fear. Good morning my friends, we had a bit of a scare a few days ago (17th Aug 2016) for about 20 minutes my three year old grandson Karamoko went missing on a very crowded Camber Sands beach. Granny was digging a boat out of the sand with his help, but somehow he wandered away and got lost. Granny panicked, mummy panicked, the people on the beach began to panic. Granny phoned me and asked me to pray. I did of course, immediately, I talked to Father God through Jesus and asked Him to return Karamoko unharmed. A few minutes later I got another call back from a very relieved Julie, “He’s been found”… What do you do in a situation when you get fearful of what might happen? In the book of the Prophet of the Lord, Jeremiah, we read about the capture of Jerusalem by the Babylonians. However, King Zedekiah was more afraid of being mocked and illtreated by his fellow Jews than he was of the mighty Babylonian King and his army. However, there’s yet one more person whom he’s also less afraid of; God. Jeremiah had, through the revealed Word of God, instructed Zedekiah, the king of Judah, to go to the Babylonians and surrender. Our verse tells us Zedekiah’s response. He did not want to do as Jeremiah / the LORD had instructed him. Zedekiah’s response reveals his fears. We note from this verse what he feared and what he didn’t. What Zedekiah Feared. “I am afraid of the Jews that are fallen to the Chaldeans, lest they deliver me into their hand, and they mock me.” Zedekiah was afraid of men and of mocking. He was afraid of what men might do to him. He feared being harmed by the Israelites who had gone over to the Babylonians. But if you are afraid of what men will do to you or might do to you, then you won’t do very well in doing the will of God. Zedekiah’s Greatest Fear: Zedekiah especially feared mocking. He had so much pride and did not want to be mocked. He was so afraid somebody would make fun of him for obeying God. Many Christians are no different. They cower before mocking and do not obey God or they might get laughed at by someone. If you are afraid of being laughed at, then you won’t be able to do much for the Kingdom of the LORD, because His ways are always the opposite of the world’s ways. He values what the world doesn’t. Remember that your Lord Jesus experienced lots and lots of mocking and scorning in order to provide Salvation for us. We must not hide our testimony for Jesus just because we’re afraid of a little mocking. Zedekiah did not fear to disobey God. He did not fear the judgment of God. Jeremiah had warned Zedekiah that not surrendering to the Babylonians would bring God’s judgment. But Zedekiah did not fear that part of the message of Jeremiah. He was more afraid of what men could do to him and that they might mock him. Imagine that, Zedekiah had been clearly warned by the LORD what would happen to him, his country, his women and children, and yet he thought more about being mocked. He’d also been told that if he surrendered he’d be SAFE. Zedekiah is not alone is this lack of fear of the LORD. To be honest we’re all a bit like that. We worry much more about what people think about us than what the LORD thinks. The truth is, even amongst Christians, there are very few people fear God today. We don’t fear His judgment upon their sins, but instead fear what people will think about us. What do you fear today? Are you afraid of men and of mocking or do you fear the the Lord God Almighty? You are going to fear someone—make sure you fear God and His judgment more than man and his mocking. Proverbs 9:10 (NIV) “The fear of the LORD is the beginning of wisdom, and knowledge of the Holy One is understanding. If only Zedekiah had listened to Jeremiah. 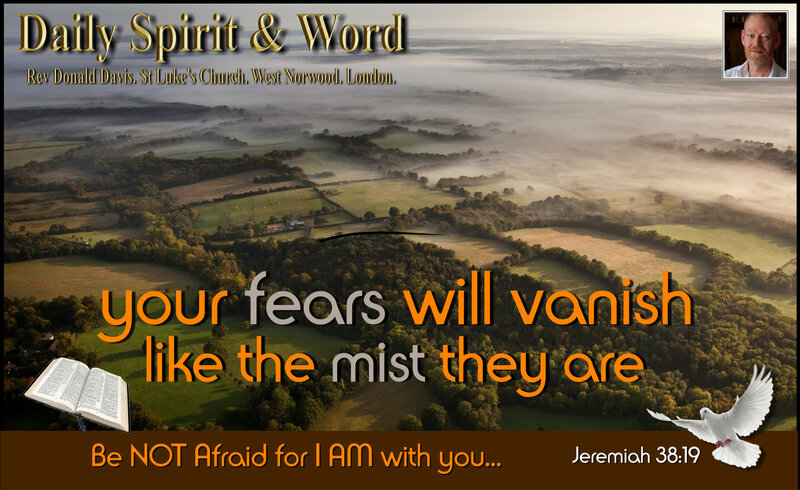 The major reason Zedekiah or every Christian shouldn’t be afraid is that the LORD is with us. When FEAR took FLIGHT: I can’t forget the day that FEAR departed from my life. All my life I’d been afraid of the dark and death, but when I trusted Jesus my fears vanished like a mist. Fear really is a mist, it doesn’t exist except in our imagination of what might or may happen. So treat fear like the mist it is, and trust in something more solid, sure and certain: Jesus is with you. Amen! So my friends, when fear strikes, TRUST in the LORD: Don’t listen to your fears: Don’t worry about being mocked: Why because when you’ve trusted in Jesus for your Salvation, then He is with you, you are indwelt with the Holy Spirit (God Himself takes up residence in your life when Jesus becomes your King). From the moment you trust in Jesus there’s no need to be afraid of men. If fear creeps in, cast it out in the Name of Jesus. If you are still AFRAID: Ask yourself this question: “Is Jesus really my King?”… If there is any part or aspect of your life that you’ve not submitted to Him, get on your knees now and hand your life over into the mighty hands of the Loving Saviour. He’ll deliver you from all your fears. Amen! PRAYER: O Lord, I can see that I’ve been listening to my fears rather than trusting in You, forgive my foolish ways O Lord. Amen. P.S. I can’t forget the day that FEAR departed from my life. All my life I’d been afraid of the dark and death, but when I trusted Jesus my fears vanished like a mist. Fear really is a mist, it doesn’t exist except in our imagination of what might or may happen. So treat fear like the mist it is, and trust in something more solid, sure and certain: Jesus is with you. Amen!